Note: These are SO MUCH BETTER than your average piece of pie. They are fingerfoods, which makes eating them quite convenient and very dangerous! They can be eaten in 2 bites. They are just perfect to follow up your holiday feast. You will need 1-2 trays of the mini-muffin tins for this recipe. Place pecans in a large, sealable plastic bag, with the air sucked out of it. Use a rolling pin to chop the pecans into small, uniform pieces. Melt the butter in a small saucepan over low heat. Transfer to a medium bowl and stir in sugar and salt with a wooden spoon. Beat in eggs, then corn syrup and vanilla. Stir in the pecans. Set aside. Combine flour, salt and sugar in a large bowl (you can place it in the bowl of your food processor). Add the shortening and butter and cut together with a fork, until you reach the consistency of coarse crumbs, with small butter pieces no larger than popcorn kernals (about ten 1-second pulses in the food processor). Sprinkle 8 tbsp ice water over the mixture. With a rubber spatula, use a folding motion to mix. Knead gently. Form a ball with the dough, adding 1-2 more tbsp water if the dough won't come together. Preheat oven to 325. Center rack in oven. Spray 2 mini-muffin tins generously with PAM. Roll dough out on a large floured surface with a floured rolling pin until 1/4-inch thick. Using a 2 1/2-inch (you can also use a 2 3/4-inch which may be a little easier) circular cookie cutter, cut as many circles as you can from the rolled out dough. Using your fingers, gently press the dough circles into each mini-cupcake insert, until it's snug in place. 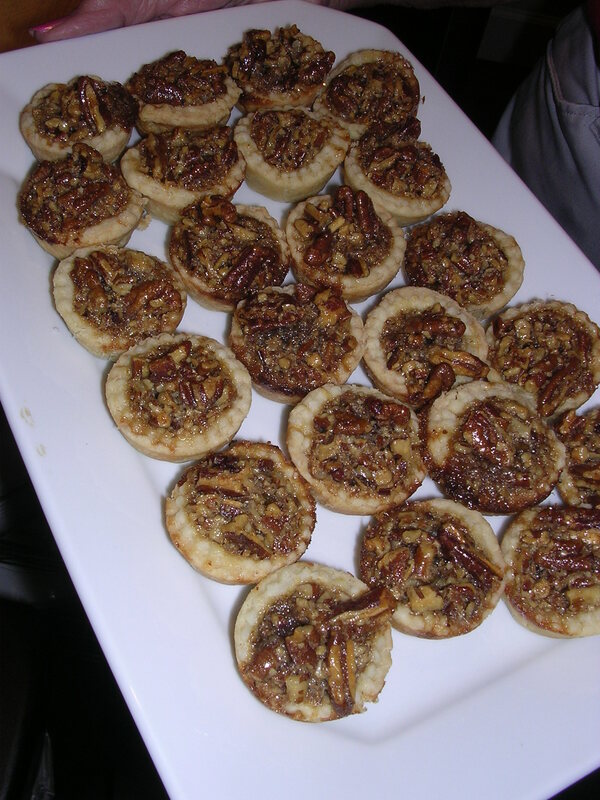 Fill each dough just below the rim with pecan filling. Bake for 40-45 minutes, until pie dough is golden brown and filling is bubbling. Cool for 5 minutes, then transfer to wire racks. Serve warm or at room temperature.